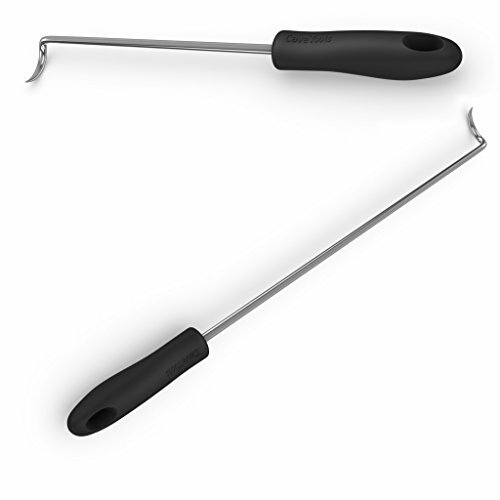 Whether you're flipping a steak, moving a pork chop, or carrying rack of ribs, you can do it all with the Traeger Pig Tail Flipper. 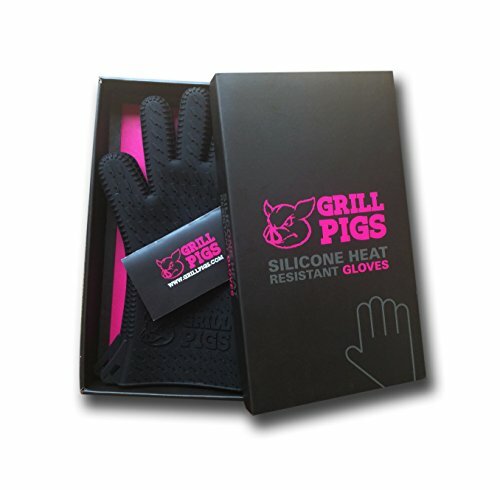 Its design ensures that you get a solid grip on your meat without marking it up or losing juice. 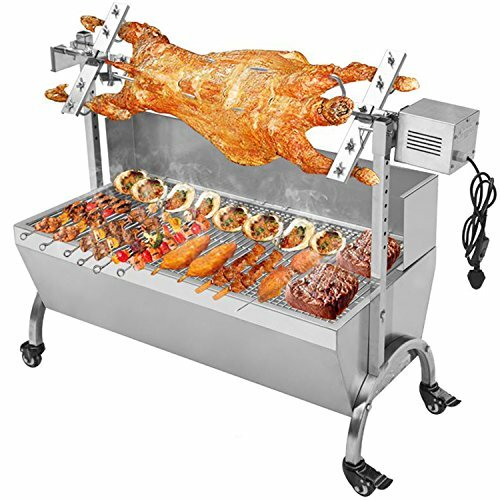 Fuel Type: Charcoal Size: 55.51"x17.72"x30.71" Motor Voltage: 110v or 220v (please comment 110v or 220v when you make order)This machine is apply to commercial use and heavy-duty in spit roast a pig ,lamb ,goat or any other animal, roasts, chicken or other foods can be skewered and grilled. Now you can roast like the pros in your own back yard. 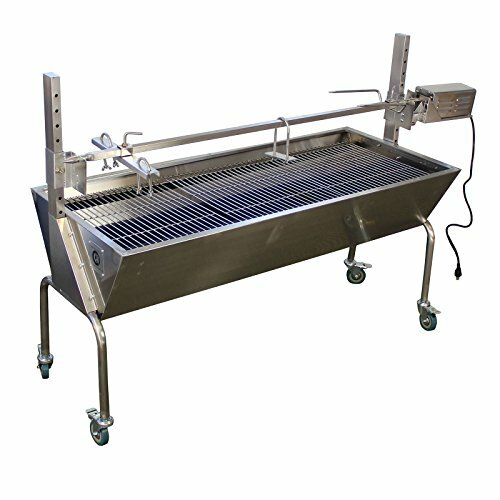 This stainless steel rotisserie roaster grill from Titan is ideal for roasting large game up to 88LBS. You can roast whole chickens, hog, goat, or lamb with almost no effort. 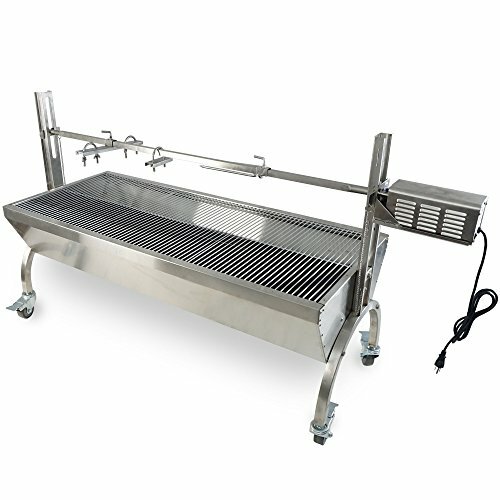 The reflective surface of the stainless steel frame reflects and focuses the heat from the coals to the meat. 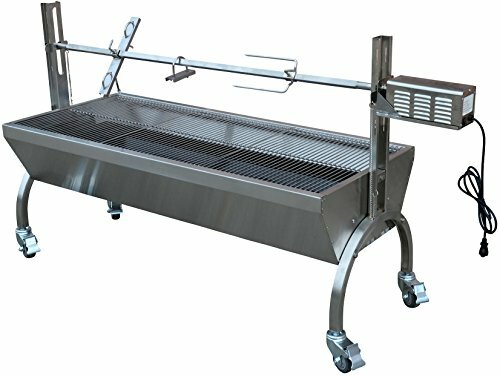 This cuts down on cooking time, saves coals, and adds flavor from smoke.Features: - High quality stainless steel - Strong 13W electric motor for large roasts - Heavy duty spit rod holds entire animal for roasting - Locking caster included for portability - Saves charcoal by directing heat to the meat - 3 tier cooking height adjustmentSpecifications:- Spit length: 51" - Motor capacity: 88 LBS. - Motor power: 13W - Speed: 4RPM - Weight: 71 LBS - Material: Stainless SteelWARNING: Fuels used in wood or charcoal burning appliances, and the products of combustion of such fuels, contain chemicals known to the State of California to cause cancer and birth defects or other reproductive harm. Now you can roast like the pros in your own back yard. 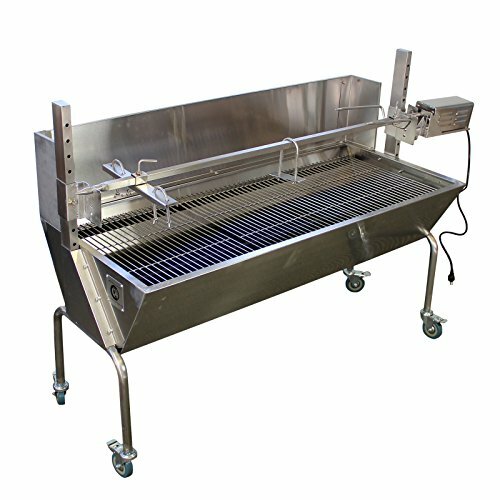 This stainless steel rotisserie roaster grill from Titan is ideal for roasting large game up to 125LBS. You can roast whole chickens, hog, goat, or lamb with almost no effort. The reflective surface of the stainless steel frame reflects and focuses the heat from the coals to the meat. 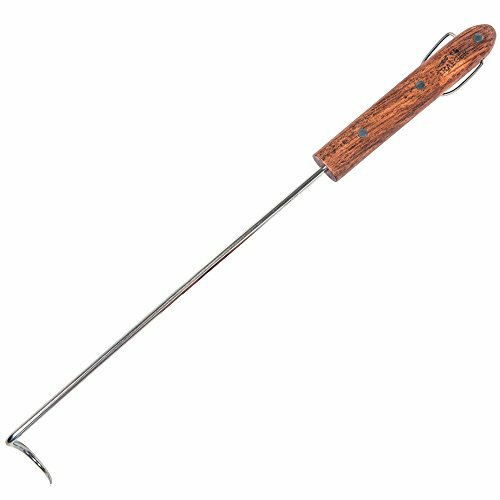 This cuts down on cooking time, saves coals, and adds flavor from smoke.Features: - High quality stainless steel - Strong 25W electric motor for large roasts - Heavy duty spit rod holds entire animal for roasting - Locking caster included for portability - Saves charcoal by directing heat to the meat - 3 tier cooking height adjustmentSpecifications:- Spit length: 51" - Motor capacity: 125 LBS. - Motor power: 25W - Speed: 4RPM - Weight: 76 LBS - Material: Stainless SteelWARNING: Fuels used in wood or charcoal burning appliances, and the products of combustion of such fuels, contain chemicals known to the State of California to cause cancer and birth defects or other reproductive harm. Container Size: 19.5 oz. 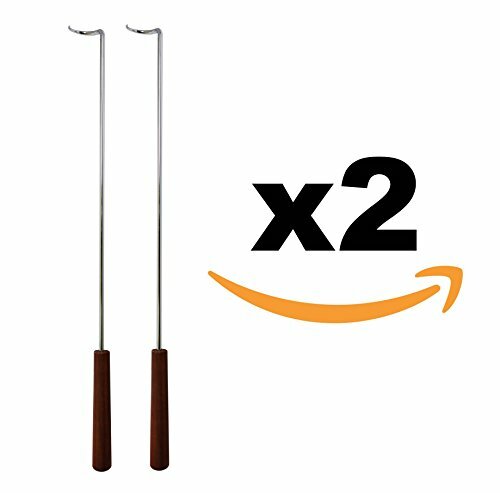 Sub-Brand: KC Competition. Number of Servings per Package: 16. Flavor: KC Competition. 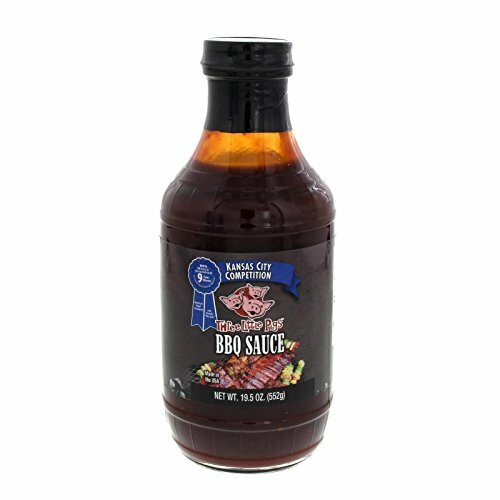 Compare prices on Bbq Pig Grill at ShoppinGent.com – use promo codes and coupons for best offers and deals. Start smart buying with ShoppinGent.com right now and choose your golden price on every purchase.